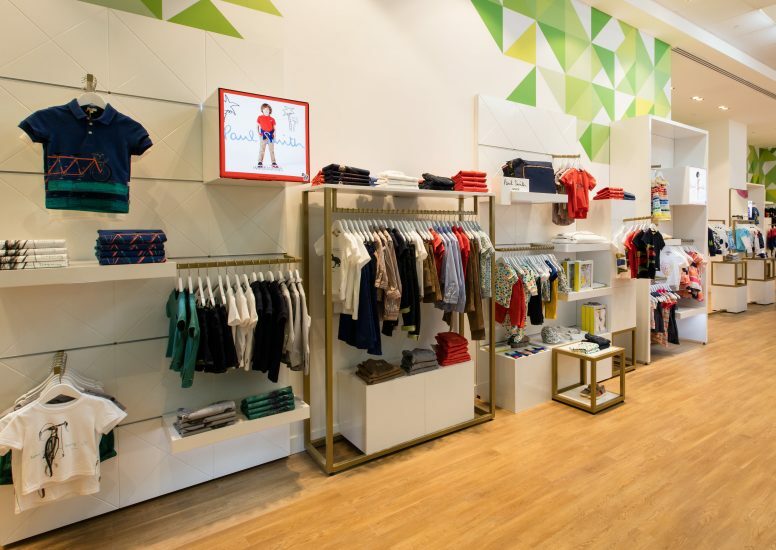 D4R were appointed by Savanna to develop, produce and install a beautiful new concept for their designer children’s clothing store in Kuwait. Working from a design concept created by TRC, we are excited to reveal the new store which is based in The Avenues; a location we were familiar with due to our previous project with That Al Salasil. To begin, we re-designed the front of the store to take the space back a small amount. This created an impressive visual impact for the entrance of Savanna; differentiating the store from many others situated in the mall. Before stepping over the threshold, the bold geometric shapes and bright colours instantly make a statement which is carried through each step of the store. 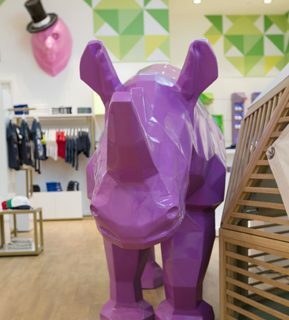 The inspiration behind the geometric shapes was taken from adaptable eco-systems of the African Savanna, a concept which could create flexibility and fluidity when developed in-store. 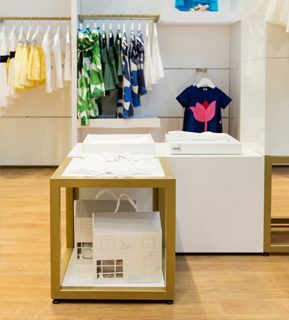 Not only does the flexibility uncover opportunities for the store to be easily changed with each season and new brand launch, but the concept creates a welcoming and interactive space for adults and children. Whilst geometric patterns can be found in the form of wall graphics, representative of the lush green colours found in the savanna, they are most visually impressive in animal form. From the outside of the store, you can spot the first of many 3D animal characters produced by the D4R team; a playful yellow young ostrich wearing sneakers. 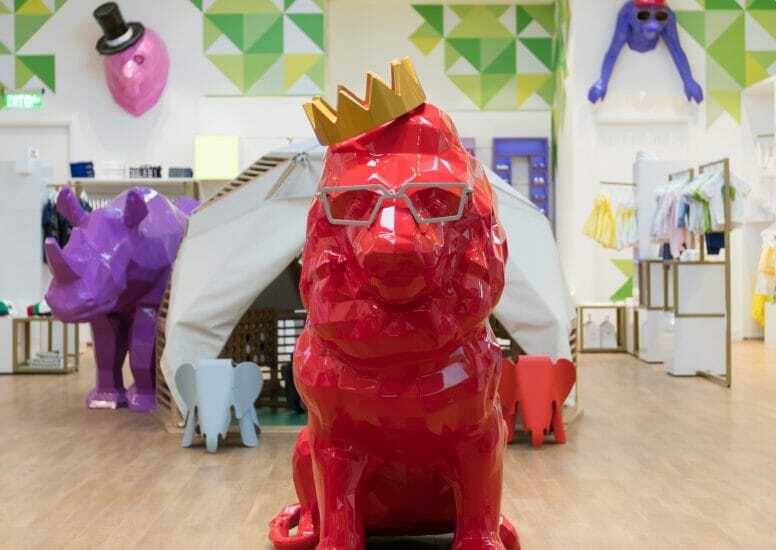 Straight ahead of the entrance is the majestic red lion, wearing a gold crown and glasses. Most important about his location in-store is the space surrounding him and his perfect child-like height, creating potential photographic moments for children and their parents. Each animal we developed is a significant representation of wildlife that inhabits African Savanna, but some also play a role in store navigation. 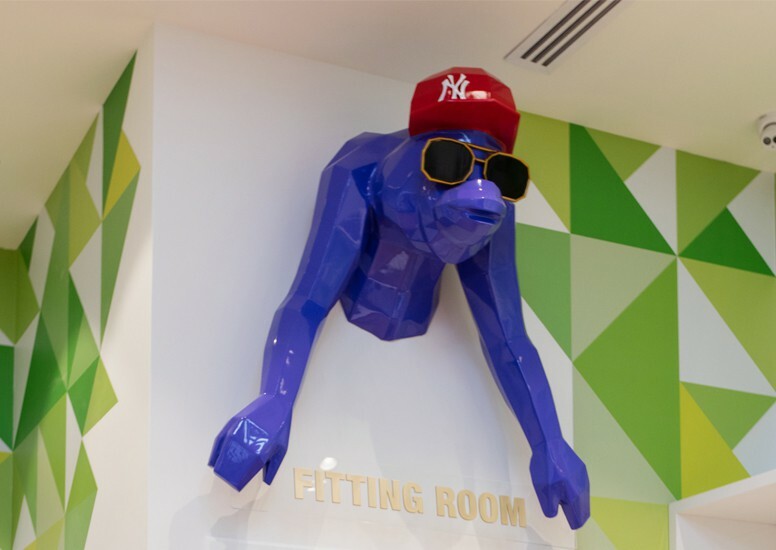 For instance, the blue monkey wearing a baseball cap and oversized sunglasses, leads the way to the fitting rooms in a playful manner whilst a life-size rhino and two smaller elephants guard the entrance of the play tent. Acting as pops of colour and bold geometric structures, these animals help to create a fully dynamic environment similar to the exploration of the savanna. Other animals are featured as part of the in-store displays are the geometric snakes which feature girl's and boy’s footwear. Colour co-ordinated – purple for girl’s shoes, green for bo'ys – the snakes can be found with shoelace tongues to accentuate the playfulness of the overall store concept. Our installation of further unitary around the store is simple but entirely bespoke for the Savanna brands, with geometric patterns etched into the material. Juxtaposed with the playful and bright 3D animal features is the use of gold and white, a colour palette synonymous with luxury. Our development and installation of brushed gold fixtures, bold white unitary and gold statement lettering on the entrance floor appeals to the nature of designer clothing. One of the most prominent in-store features can be found at the till area. Set against a geometric mirrored backdrop, a regal 3D elephant faces customers waiting to pay. Streaming from the elephant’s trunk is a stunning waterfall display made from aqua-blue square blocks; truly bringing to life the animals of the savanna. The cash desk emulates this with a blue square design to tie the entire concept together. 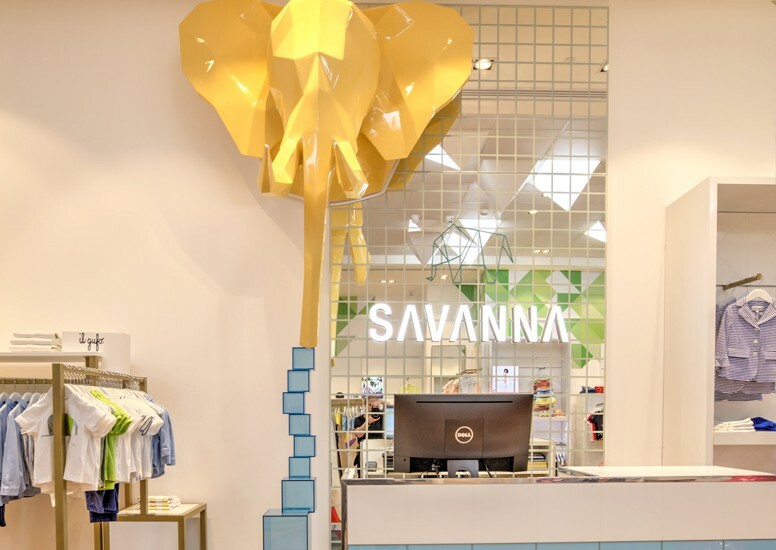 We appreciated the chance to bring this concept to life for the Savanna brand, enabling them to open their first store with a truly exciting design. 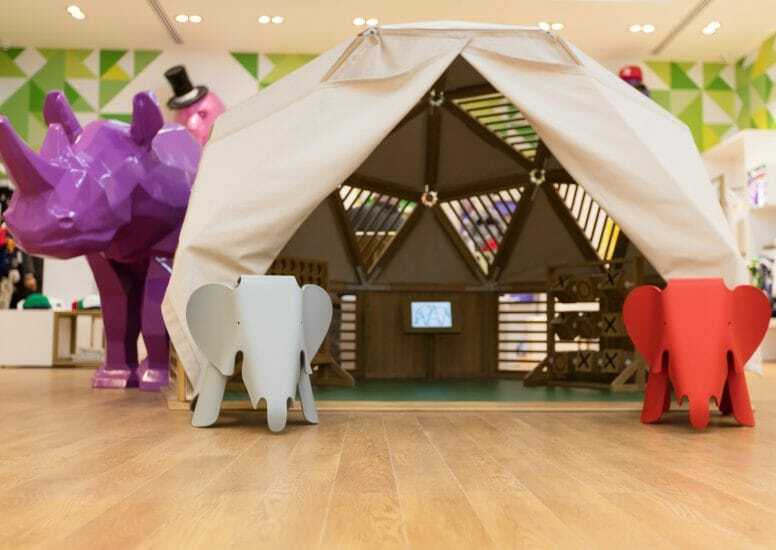 Whilst parents lead the way when it comes to choosing children’s clothes, this store engages with the entire family through key signifiers such as interactive elements, playful animal characters and smooth product displays. The first ever Savanna store is open in The Avenues Mall, Kuwait and we encourage every visitor to explore this exciting concept!